Glenavon manager Gary Hamilton. Pic by INPHO. Glenavon manager Gary Hamilton is playing the numbers game in pursuit of fantasy football for the Mourneview Park club. Spirited Europa League performances produced a memorable home success over full-time Molde before an away exit - with both displays developed off the foundation of facts and figures. Now Hamilton wants to utilise the data for domestic progress. “We have always based part of our recruitment strategy around statistics, things like how many times does a winger deliver a cross, how many shots is a striker getting off in a game or headers by a centre-back? “Andy Hall is the prime example as we signed him from outside the top flight based, in part, on his assists figures. “Now, thanks to support from the Board of Directors, we have been able to call on GPS systems for each player over pre-season and that information is invaluable. “To be able to sit down and draw on cold, hard data takes away the emotion or prevents making all decisions based on the naked eye alone. “The goal is to maximise the GPS feedback so we can protect players from picking up certain injuries due to too many games. “Last season Mark Sykes had a dip but, reflecting, we were maybe too reluctant to pull him out of the side because of his overall return. “Talking to a player and trying to let him know he is going to be rested for his own good often can disappoint the individual. “Now in a similar situation with someone, we can turn to the numbers and show how maybe the distances confirm a drop, so it becomes a choice backed up by information. “You never want to do a player a disservice by putting him in a position which could lead to less than his best or, worse, injury. A return to the European stage remains the Glenavon goal alongside pursuit of prizes. “You always want to aim for the league title but look on a top-six finish, first and foremost, as an objective and we want that feeling again of representing the club in Europe,” said Hamilton. “To break the 70-point barrier with Glenavon for the first time since the revamped league structure is another internal objective. A summer recruitment strategy designed to strengthen the traditional playing style developed under Hamilton has left the Lurgan Blues boss encouraged. “We are delighted with pre-season and how the signings have settled in,” said Hamilton. 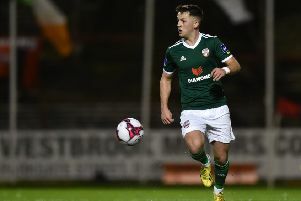 “Someone like Niall Grace is clocking up average numbers comparable to Premier League professionals, which is just incredible. “We did not suffer too much from injuries last season, there is greater depth now to allow us to make the right decisions on players in terms of fitness and to keep people in the best possible condition.